Skiing in winter, walking or biking in summer, gazing at the fabulous scenery at any time, most visitors to the French Alps come to appreciate the mountains. 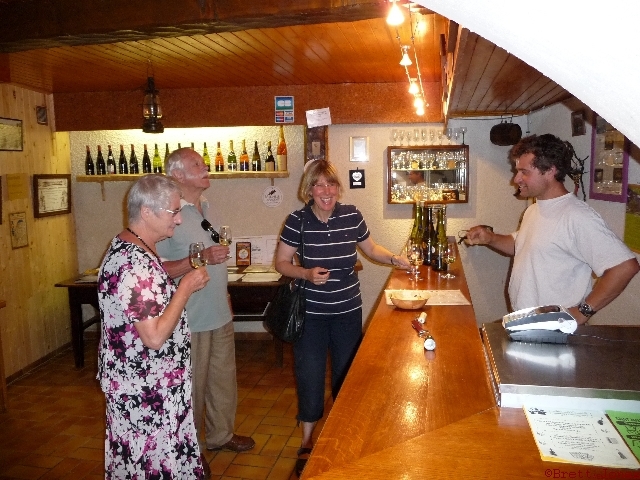 But, for a wine lover it’s well worth taking a day out of your schedule to explore the interesting Savoie wine areas, and sample the unusual wines produced in the small wineries dotted along the valleys. The wines you will taste are usually far better than you will be offered in an Alpine resort hotel or chalet. From the towns of Chambéry, Aix-les-Bains or Albertville, or even if you are up in one of the ski resorts (many within an hour’s drive), a day trip to the vineyards is more than feasible. The Savoie vineyards are quite scattered, but the most concentrated area is around Chambéry, at the foot of Mont Granier in the crus of Apremont and Abymes, and between Chambéry and Albertville in the valley called the Combe de Savoie, with a beautiful stretch of vineyards on the south-facing foothills of the Bauges mountains. Coming from Albertville, one of the nicest vineyard drives I know is between Fréterive and Montmélian. Earlier this year, I took a friend along this road to visit the welcoming Tiollier brothers of the lovely-named Domaine de l’Idylle in the village of Cruet. Ever-smiling François and Philippe divide the work in this domaine that produces both white and red wines, primarily from Jacquère and Altesse grapes for whites, and from Gamay, Pinot and Mondeuse for reds, but with an emphasis on the unusual Mondeuse which does particularly well in this part of Savoie. They have recently built a new underground cellar, linking up to the contrasting old one, which is still in use – if you visit, then do ask to take a look. My friend fell for their white wines in particular, both the fresh and simple Savoie Cruet from Jacquère and their always-good, slightly fuller Roussette de Savoie. I was happy to find that their Mondeuse La Saxicole was tasting as good as ever and invested in some from the 2007 vintage – this wine is made with slightly lower yields than normal and a little micro-oxygenation to soften the hard tannins, it develops well over about five years. From there we drove to the Lac St-André at the foot of the vineyards of Apremont and Abymes and the looming mountain of Mont Granier. A large section of this dramatically-shaped mountain, at the north end of the Chartreuse range of mountains, collapsed in an horrendous land-slide in 1248 killing thousands of people and changing the terroir (something of eventual benefit to the vineyards). The small lake area is a great place to re-charge in-between tastings and you can stroll around the lake in about 20 minutes. Better still, what was a very basic restaurant by the lake was taken over a couple of years ago. The Saint-André restaurant is now an excellent place to enjoy a very decent meal and has a large terrace where you can see both lake and vineyards. My friend and I enjoyed lunch there in April, and Brett and I were equally pleased with our meal when we went the other day. Both times we were tempted by the excellent €33 three course menu – if you visit on a weekday, they do a €14 simple 2-course lunch too. The wine list supports the local growers as one would hope and there are a few half bottles. This last time we drank a lovely 2009 Pinot Noir from Domaine Blard, based in Apremont, who I have yet to visit; previously we enjoyed a Château de Monterminod Roussette de Savoie. If you are tempted after lunch to visit an Apremont grower, I can highly recommend a drive up towards the Col du Mont Granier (if you drive all the way up to the pass, allow time for a 20 minutes walk to see a brilliant view). In the little village of La Palud, just beyond Chapareillan, you will find the rising star of this area, Domaine Giachino owned by another set of brothers, David and Frédéric Giachino. They converted to organic growing a few years ago and their wines get better and better every time I taste them, and include an exemplary, properly dry Apremont. The Giachinos also provide the cellar facilities and help with the winemaking for a friend and organic grower Jacques Maillet, whose vineyards are over in the Chautagne district. If you visit the Giachinos, you can usually taste some of Jacques’ wines too. For a different day out, you might like to explore the vineyards over in Jongieux, through the Tunnel du Chat on the other side of the Lac de Bourget, an area also endowed with several excellent restaurants. The view down to the Jongieux church and across to the Marestel vineyard slope above is one of my favourite vineyard/village views. There are several good producers to visit here, and this summer we took friends to one of the first ever Savoie wine producers I got to know – Domaine Edmond Jacquin et fils. The sons look after it now, with the younger Jean-François increasingly in charge as brother Patrice has many other interests. They make lovely Gamay red and rosé, but it is their Roussette de Savoie and their even more intense Marestel, both from the Altesse grape, that shine here. The day we visited was the day off for the Morainières restaurant in the middle of the Marestel vineyard slope, so we headed back through the tunnel to Atmosphères, somewhere we hadn’t eaten at for a while. It was better than ever in terms of food and service, and I was delighted to discover their list of Savoie wines had expanded too – a real showcase for the wines of the region, which I applaud. Being lucky enough to have lived part of the year in the mountains of Haute Savoie for more than 15 years, I’m proud to have put together our Savoie wine travel guide on the main website and have just updated it with our recent discoveries. There you will find many more winery, restaurant and accommodation recommendations, along with a run-down on the different grape varieties, appellations, crus and a description of the main wine styles. Next time you visit the French Alps, do look out for some of the great Savoie wines and, if possible, schedule in a day out to meet some of my wonderful vigneron friends – it’s always best to make an appointment first, do tell them I sent you! This entry was posted on Monday, October 18th, 2010 at 11:35 am and is filed under Places to Stay, Eat and Shop, Vineyard Visits. You can follow any responses to this entry through the RSS 2.0 feed. Both comments and pings are currently closed.